There’s nothing quite like relaxing in your own private getaway in your backyard. Whether on one of our garden benches or pieces of pool furniture available, you’re sure to find something here that will suit your property perfectly. We specialise in supplying Australia with Adirondack chairs. Adirondack chairs are a classic style of outdoor furniture, also known as Cape Cod, Muskoka or Westport chairs. We also stock a growing range of other items, such as settings, benches and an array of unique garden structures. The Porch is able to ship our wooden furniture to Melbourne, Perth, Adelaide, Sydney, Brisbane and other locations across Australia. Adirondack chairs are a beautiful traditional chair, the design of which originates in Westport in upstate New York, east of the Adirondack Mountains. The rustic style, originally made from eleven flat boards, is perfect for pool areas. It was developed as an outdoor lounge chair and the original profile has changed little over time. To perfectly complement the unique design of Adirondack chairs we have available, be sure to take a look through the range of accessories that we have. From footrests to side tables, we supply everything you’ll ever need to keep your pool or garden area looking sensational. Do you wish you could spend more time in your yard? A beautiful inviting garden bench is the perfect way to make the most of your space. Garden furniture (with matching accessories) is functional and adds another feature or focal point to outdoor décor. To purchase call (03) 8288 1799 or visit our online store. What's the difference between a Cape Cod and an Adirondack chair? Our range of garden and pool furniture, although drawing inspiration from American design, fits in well with any type of garden, whether it’s a native Aussie bush style yard or a beautifully landscaped English style garden. Made from a range of different materials including hardwoods and maintenance-free composite ‘eco-woods’, they’re built to last for decades, even in harsh conditions. 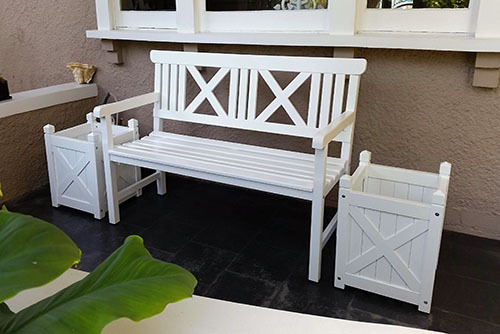 If you were considering wicker furniture, consider the polywood eco-collection instead, via our sister-site polywoodoutdoors.com.au, as it is especially ideal for locations which receive harsh weather conditions as they are designed to withstand rain, sun and even snow. From time to time we also stock a small selection of planter boxes, side tables and other accessories which match well with our furniture. We invite you to explore the entire selection via the Products drop down menu at the top of this page. For further details about any of the items you see on our site, please feel free to contact us; we’re always happy to help.